Chickens form strong family ties. A mother hen begins bonding with her chicks before they are even born. She will turn her eggs as many as five times an hour and softly cluck to her unborn chicks, who will chirp back to her and to one another. After they are hatched, the devoted mother dotes over her brood, teaching them what to eat, how to drink, where to roost, and how to avoid enemies. 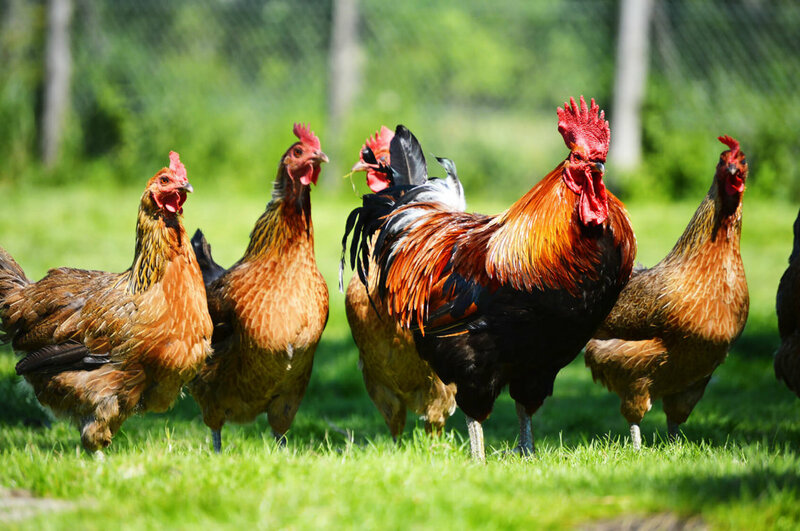 Male chickens (called roosters) are most famous for greeting each sunrise with loud crows, often acting as alarm clocks for farmers. Chickens are fascinating creatures. They have more bones in their necks than giraffes, yet they have no teeth. They swallow their food whole and use a part of their stomach called the gizzard to grind it up. Chickens actually have many similarities to humans: the majority are right-footed (just as most humans are right-handed), they see a similar color range, and they love to watch television. Many also enjoy classical music, preferring the faster symphonies to the slower ones. Having a private nest in which to lay eggs is extremely important to hens. The desire is so strong, in fact, that a hen will often go without food and water, if necessary, to use a nest. The nest-building process is fascinating. A hen will first scratch a shallow hole in the ground, then reach out to pick up twigs and leaves, which she drops onto her back. After she has gathered some material, she'll settle back in the hole and let the material fall off around the rim. She will continue to do this until her nest is completed. As highly social animals, chickens can bond very closely to other animals, including humans. They will fight to protect their family and will mourn when a loved one is lost. When they have bonded with a human, chickens will often jump into his or her lap to get a massage that they enjoy fully with their eyes closed, giving every indication of being in ecstasy. "It's just a chicken" is a retort heard often when concern for the welfare of chickens is exhibited. This comment reflects just how misunderstood these animals are. Chickens are just as deserving of our respect and compassion as are all other animals.